We recieved the Techno Gears Marble Mania Dual Sppedwas 2.0 for review and here is how it looks. 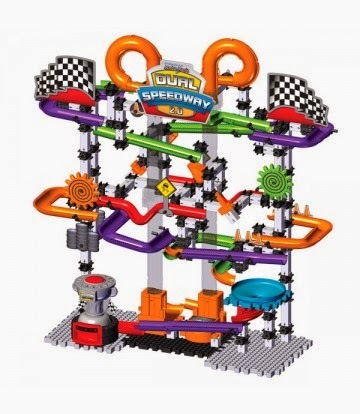 Dual Speedway 2.0 is the checkered flag lap in your child s creation of twisting and turning racing tracks. With dual launchers your kids can race against each other and see who crosses the finish line first. More than 300 pieces will create an exciting marble speedway. Colors may vary. Requires two AA batteries and two button cell batteries. Colors may vary. Ages 8+ years. Brendan is 11 and this seemed a little hard for him to get the pieces put together and apart so we had to help him. It came with alot of little pieces and I seperated them before we started working on this. Brendan was hard at work trying to get this put together. I would say this toy would again be geared for a bit older age group. You have to really pay attention to the instructions one piece put wrong and it throws the whole thing off. We had to take this apart 2 times andf start over to try and find the right one. Overall this is a fun toy for the whole family to play with.